Held annually at Tapak Pesta Kaul, Kuala Dana or Kala Dana known by the locals. It is located by the seashore in Mukah, Sarawak. Kaul was looked upon as a religious ceremony to appease the spirits of the sea, land, forest and farm making it the most important festival in the Melanau calender. The festival is a ritual of purification and thanksgiving as well as one of the propitiation for good fortune. Its marks the beginning of the Melanau calender which begins at the end of the Northeast monsoon. Kaul takes place in third week of the month of April every year. 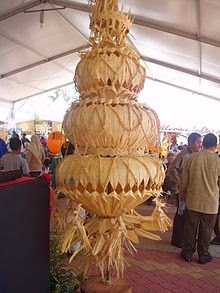 The famous Tibow is commonly used during this festival. 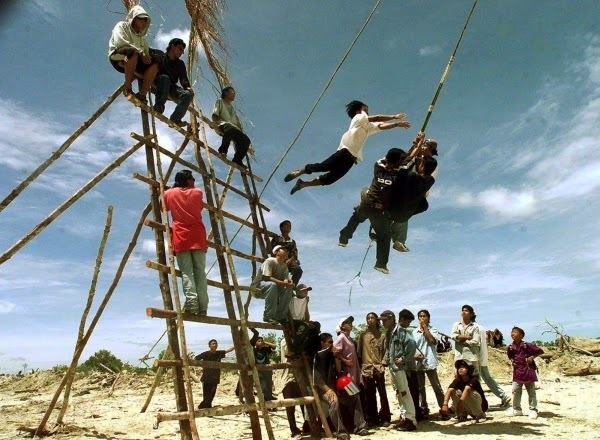 The Tibow is a 20 foot high swing, here youths dive from a high bamboo scaffolding and catch a swinging l rope as it reaches the height of its arc. First one, then two and eventually eight young men hanging in a clump from the giant swing as it soars above the beach. Pesta Kaul is about more than giant swings, it's a colorful festival with a flotilla of highly decorated boats,beach games and lots of delicious Melanau food. Traditionally, during the monsoon, the river mouths were closed. To be honest, I've been to this festival few times and that was when I was a kid. I would love to go back to and witness it once again. So, for those that have never experience such festival, here is the date for this year Kaul Festival 23/04/2014 to 27/04/2014. Mark your calender, hit the road and enjoy the festival season! A game of Tibow anyone?